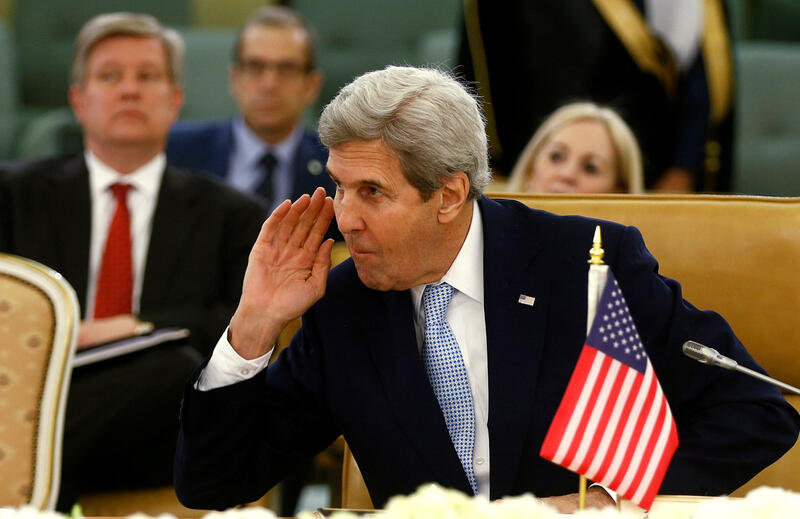 JERUSALEM – Several Israeli officials are lashing out at U.S. Secretary of State John Kerry ahead of his planned policy speech about peace prospects with the Palestinians. The Israeli government is angry the U.S. allowed a resolution to pass in the U.N. Security Council calling settlements in east Jerusalem and the West Bank a “flagrant violation” of international law. With the U.S. expected to participate in an international peace conference in France next month, Kerry is planning a final policy speech Wednesday to address the issue. Erdan told Israel Army Radio that if Kerry lays out principles for a peace deal, as he is expected to do in his speech, it will limit President-elect Donald Trump’s ability to set his own policy on the Israeli-Palestinian conflict. “It is an anti-democratic step because it’s clear that the administration and Kerry’s intention is to chain President-elect Trump,” Erdan said. Kerry mediated a nine-month round of peace talks that broke down in early 2014 with little progress. The international community overwhelmingly opposes Israeli settlement construction in the West Bank and east Jerusalem, territories captured by Israel in 1967 and claimed by the Palestinians for an independent state. The Palestinians, and most of the world, see settlements, now home to 600,000 Israelis, as an obstacle to peace. Israeli Prime Minister Benjamin Netanyahu has said the conflict with the Palestinians, including the fate of the settlements, must be resolved through direct negotiations and says that international dictates undermine the negotiating process. Despite the Israeli anger, Netanyahu ordered a Jerusalem planning committee to delay a vote on approving construction of some 500 new homes in Jewish developments of east Jerusalem, a city councilman said. Council member Hanan Rubin told The Associated Press that Netanyahu asked to delay Wednesday’s vote so as not to antagonize relations with the U.S.
Revivi made the remarks ahead of Kerry’s speech. Revivi said Kerry is “the worst secretary of state in history” who “chose to stab his closest ally in the back” and knows little about the realities of Israeli settlements in the West Bank. Although the U.S. has long opposed Jerusalem settlements, it has generally used its Security Council veto to protect its ally from censure. On Friday, it abstained from a resolution calling settlements a “flagrant violation” of international law, allowing it to pass by a 14-0 margin. While the Palestinians hope to capitalize on the momentum of the U.N. vote, it appears Israel’s nationalist government is allowing its relationship with the Obama administration to sour and banking on the incoming Trump administration to undo the damage with redoubled support. Mr. Trump appears to support the notion that he will be friendlier to the Netanyahu administrations policies, and as recently as Wednesday morning expressed disdain for the Obama administration’s handling of Israel. not anymore. The beginning of the end was the horrible Iran deal, and now this (U.N.)! Stay strong Israel, January 20th is fast approaching! In Washington, State Department spokesman Mark Toner said Kerry would lay out his vision for Israeli-Palestinian peace in the speech Wednesday. “He feels it’s his duty in his waning weeks and days as secretary of state to lay out what he believes is a way to a peaceful two-state solution in the Middle East,” Toner said.